More “Chimaek” eateries are flooding our shores and one of the better ones is Chir Chir Fusion Chicken Factory located in Pavilion Elite. Ever since it’s opening, foodies have been flocking over to the largest Chimaek restaurant in South Korea with over 100 outlets across the country, China, Taiwan, Indonesia and Singapore. Pronounced “Chi-ruh Chi-ruh”, Chir Chir derives its name from the tantalizing sounds of bubbling oil when the chicken is placed in the deep-fryer. It’s also a sound that denotes a good indication of a lip-smacking crispy fried chicken. The term Chimaek, combination of “chi” for chicken and “maek” for beer, only really took off on our shores after the Korean drama My Love From The Star became a worldwide hit series. True enough, I did learn of Chimaek through that movie though fried chicken and beer has long been a big hit on their own everywhere else. What makes Chir Chir one of the leading Chimaek in South Korea is that this fusion restaurant prides themselves for their signature freshly cooked chicken dishes that are fried only upon order; it’s not pre-fried and neither is it frozen! Each dish is paired with proprietary sauces and marinade from Seoul to ensure consistent quality and flavours in all of Chir Chir outlets. The first outlet in Malaysia, Chir Chir in Pavilion has a modern and eclectic ambiance that denotes casual dining. Aiming for industrial design meets Korean chic, there’s plenty of chicken and beer knick-knacks everywhere to remind you of its signatures. The menu is made for easy ordering with plenty of pictures of the dishes as well as the beverages. Solid with plenty of choices besides just fried chicken, Chir Chir even offers roasted versions as well as other Korean dishes to please diners of all ages. First up, drinks made headline with Passion Yellow Tok! Tok! (RM24.90 non alcoholic | RM32.90 alcoholic). Served at table side, the infusion is fizzed right before your eyes with a soda charger. 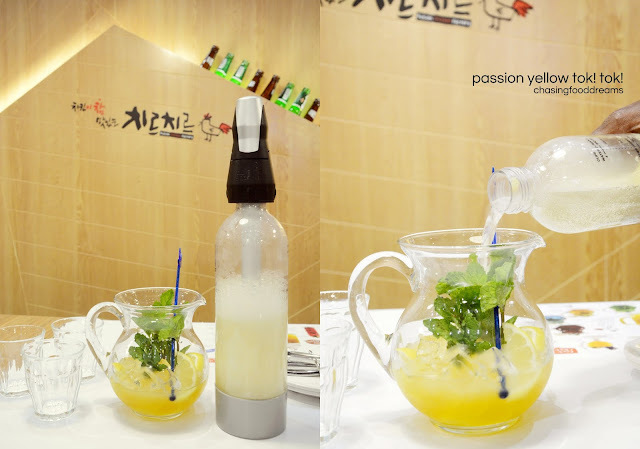 We certainly enjoyed the fruity tang of the passion fruit, even without the soju. The Aqua Double Smoothie (RM32.90 with Soju) was even better. We couldn’t resist ordering the Soju version added to the slushy ice blended mango puree topped with tropical fruit slush and finished with plenty of whipped cream. There also the virgin version as well as other flavours like Raspberry and Mojito. We also enjoyed the Lady Killer (RM32.90), a whole beer gets tipped into a slush of citrus ice blend. Refreshing and very enjoyable way to a lady’s heart! Chir Cream Beer (RM24.90 – 350ml | RM34.90 – 650ml) is simply a must! Beer topped with a crowning glory of whipped cream served chilled certainly goes so well with fried chicken and all the other Korean dishes. The trickiest part of this is trying to drink the beer without getting whipped cream all over your mouth or nose… but then again, that could be a cute one for a photo opt! Our first dish up of Topokki & Cheese (RM15.90) had me falling cheesy in love with the dish. Korean rice cake, soft and lightly chewy is gloriously smothered in a pool of lightly bubbling pale cheese sauce. The thick and luscious cheese sauce is stringy and very delicious. It’s not overpowering with cheese but rather a right balance of cheesy goodness that one can enjoy a lot with the rice cakes. Let’s call this the Korean mac and cheese that all cheese lovers will love. It was a big debate when it came to ordering the salad but Honey Grape Salad (RM29.90) won our votes. My photo didn’t do justice to the size of this salad cos it feeds at least 3 people. Served in a large wooden bowl, it was full of chilled crunchy green grapes, walnuts, almonds, raisins, pine nuts and finished with a scoop of housemade ricotta cheese and whipped cream with lemon and tortilla toast. Mixing it all up, the salad was superb. One of the best fruit salad I have ever had. A must order when you’re at Chir Chir!! When the plate of Crispy Fried Chicken & Spicy Fried Chicken (RM49.90 + RM7) arrived, I was practically salivating at sight. We opted to top up RM7 to change half portion of Fried Chicken to Spicy Fried Chicken so we get best of both flavours. Biting into the Crispy Fried Chicken, the crunch factor was literally music to my ears. It was super crispy and yet the flesh was tender and so juicy. Well-seasoned, the fried chicken was perfect. Being used to the fried chicken from fast food places, I honestly never knew how fresh and not frozen fried chicken can make such a difference. It’s definitely harder now to go back to those fast food chains after savoring Chir Chir’s Crispy Fried Chicken. The Spicy Fried Chicken is also yummy with a solid kick of heat from the lightly sweet and very spicy sauce coating the fried chicken. What I also like was the fact that they sprinkled almond flakes on this one which added a lovely nutty and more crunch factor. The fried chicken comes with a side of honey mustard sauce and a fruit salsa. Just when I didn’t think any other chicken could top their Crispy Fried Chicken, the Spicy BBQ Roasted Chicken (RM62.90) had me at Hello!! If that fried chicken was superb, this was sublime. The texture of the roasted chicken is amazingly firm yet tender. I opted for a breast piece and it was soft and smooth, unlike most where the meat tends to be fairly tough as it is very lean. It was also very juicy, making the chicken utterly delicious. We couldn’t resist ordering the Honey Butter Chicken (RM56.90). One of the hottest flavours in Korea, they now practically flavour everything with honey butter nowadays. This one features boneless chicken chunks that is lightly battered and fried to golden crispy chicken, tossed in Chir Chir’s honey butter sauce and seasoning, served with a side of creamy honey mayo garlic sauce. There is also battered rice cakes, potato wedges, dried cranberries and almond flakes. It’s lightly sweet and buttery with a sandy texture but I really enjoyed it together with the rest of the accompaniments. Another dish worth trying if you never had honey butter flavour before. Pasta fans will enjoy Chir Chir Mi Chir (RM62.90). Oven roasted Cajun fried chicken tenders is buried under a pile of pasta dressed in creamy cheesy sauce and covered with more mozzarella cheese. This one is a tad too heavy for my palate but it would make a very filling meal for two at least. There’s more than just chicken at Chir Chir. Spicy Seafood Soup (RM54.90) offers a piquant seafood broth loaded with squid, prawn, mussels, crayfish, vegetables and Korean sweet potato noodles. The broth is a little spicy with lots of seafood oomph while the seafood is fresh and cooked well. Makes a nice change if you’re looking for more than just chicken. The Spicy Topokki (RM29.90) is decent but nothing to shout about compared to all the other dishes. The thick sweet and spicy classic topokki sauce with chewy rice cakes, soft fishcakes, crispy Cajun fried squid and deep fried hard-boiled egg is one of Korean’s popular street food. The version here is faultless but didn’t impress us as much as their chicken dishes. There’s one dish that I haven’t seen in our Korean restaurants here and it’s a dish with chicken feet. Cheese Fire Chicken Feet (RM34.90) has chicken feet coated with a fiery spicy sauce paired with a pool of melted cheese sauce, boiled egg and seaweed rice balls. The chicken feet is not as soft so there is a good bite to this. The cheese sauce does tone down the heat on the chicken feet and the seaweed rice ball is very tasty. Chir Chir Fusion Chicken Factory has really nailed their chicken dishes to near perfectness. Prices are on the higher end but that’s justifiable for the quality and portion they served. All of their dishes we tried is larger in portion than a lot of places and feeds at least 2 to 3 people. Go for their chicken dishes because they do those really well and their drinks are very good too. Now I am wishing for more Chir Chir outlets to open nearer to me so I can get my fix of fried chicken more often.